If you’ve seen the pallet rack clip catalog at Shelf-Clips.com, you know that we carry a lot of Unarco pallet rack clips. Nine, to be exact. Unarco has produced a number of pallet rack lines, and, as part of our mission to be a complete and comprehensive supplier of replacement pallet rack clips, we wanted to make sure we offer clips for as many of them as possible. To provide informative value and give a closer, more in-depth look at these clips, we’re featuring them in a series of blog posts. This post in particular covers two of our nine Unarco clips: the T-Bolt Clip and the Kingway Beam Clip. The aptly named T-Bolt is made up of two pieces: a T-shaped bolt and a nut that screws onto it. This design differs in functionality from many pallet rack clips, including many of the other Unarco clips carried at Shelf-Clips.com, in that it is screwed into the pallet rack system instead of simply being held in by the force of gravity. Unarco T-Bolt Pallet Rack Clip sets are available from Shelf-Clips.com in boxes of 26. Unarco’s Kingway clip is fundamentally different from the Unarco T-Bolt set. For example, unlike the T-Bolt, it is a single piece clip. Also, the Kingway clip is a true “clip”, as opposed to being a nut-and-bolt set like the T-Bolt. 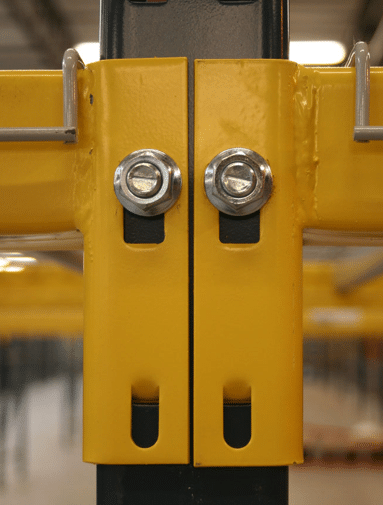 The Kingway clip is used by hooking the lower portion of the clip onto the underside of the pallet rack beam connector, and pressing the protruding top portion of the clip through aligning holes in the pallet rack beam and upright frame. 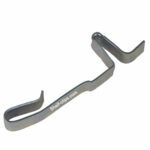 Kingway clips are also carried in stock at Shelf-Clips.com, but in boxes of 50. 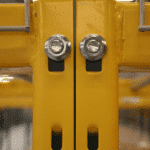 Each of these clips plays a vital role in ensuring the safety and performance of their respective pallet rack systems. After all, they are called “safety clips” for a reason. We hope this blog has been informative, particularly if uncertainty has caused you any hesitation in the purchasing of safety clips. To order or learn more about these or other pallet rack safety clips online, see our catalog at www.shelf-clips.com. If you’ve got any questions you’d like to ask one of our sales team members about, give us a call at 855-289-2547. Thanks for reading, we look forward to hearing from you.